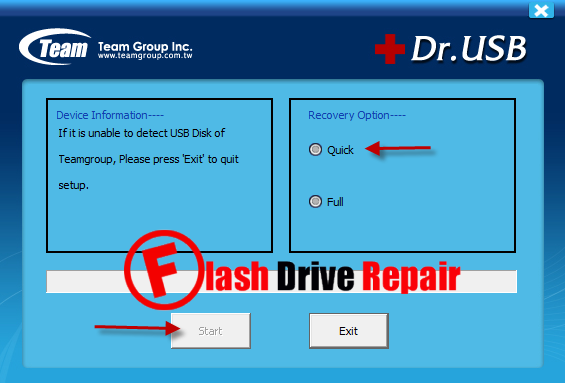 Do you have format errors with Skymedi USB flash drive .Repair Skymedi Chip controller with Team Group Recovery Disk v3.4 software and fix all format errors . Write protection problem "when you try to open or move files to your flash drives and get this message "The Disk is write protected " . When you try to open your USB flash disk "You got this message "Please insert disk or no media ". When you try to format your flash drive with windows format tool and you got this message "Windows Unable to format disk " . Flash drive is unrecognized by computer . Flash drive capacity is 8MB or 15 MB or less than the actual size . Download Team Group Recovery Disk v3.4 from the download links in the end of this article . Insert corrupted USB pen drive to your computer . Open the software and wait until it loaded then choose the type of format "Quick or Full " . Click Start to begin formatting your corrupted Skymedi flash disk .